The LEDress is powered by a small "wall wart" 24 volt AC low-voltage transformer that is a UL rated Class 2 "limited energy device". It is a safe do-it-yourself project to install the transformer and LEDress display. The transformer is free with the LEDress. Mounting the LEDress display and running wires to it takes an hour or so, but it only needs to be done once and you are set for life! Battery power was not chosen because LED displays of this size and brightness would go through a lot of batteries during their many years of intended use. It is likely that power failures over the years will be shorter than the time it takes a person to get around to repeatedly replacing batteries. Stored solar power was not chosen because there are too many locations that would not receive enough direct sunshine to keep the unit lighted brightly all night, every night. Although solar units are very easy to install, they use rechargeable batteries that will eventually need replacing. The batteries may need changing every 3 to 5 years--if they are replaceable and of a type easily found. If you intend to use a power source other than the wall transformer, please mention it in the "Special Instructions" area on the order form. Doorbells: It will be assumed your doorbell voltage is 16 volts AC, but that voltage is not universal; measure it if possible. Your LEDress will be modified to work on 16 volts. Landscape lighting: Most systems are 12 volts AC, some have higher taps. Your LEDress will include a voltage doubler circuit. Security systems or CCTV: These can directly power a LEDress display of any LED color. Please specify if your system voltage is 24 volts AC or 24 volts DC. Power consumption: Less than 3 watts; the display uses less than 1 watt and the transformer uses the rest. The electricity will cost less than batteries would have. If the transformer is ever damaged, contact the Logician to get an exact replacement, other voltages will not work. 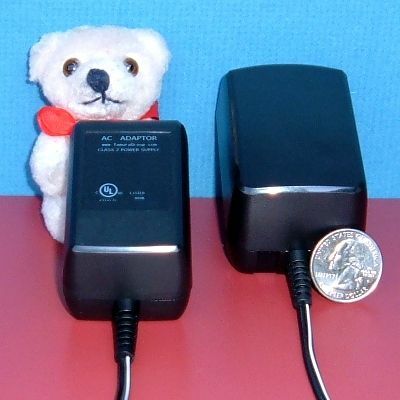 Optional Back-up power: The AC adaptor could be plugged into a computer's UPS device, but getting wire out to the display could be tricky. If you want to cobble together your own battery backup circuit, contact the Logician for advice. If you are not in the U.S. or Canada, please contact the Logician for advice as powering the LEDress in other countries is possible.